Glad Joel posted this, because I almost missed it: Majel Barret joined her husband Gene Roddenberry Where Many People Have Gone Before. Maybe you think you don't know her, but you do. You have heard her voice many times: She was the voice of the Enterprise's computer. She died yesterday age 76. The First Lady of Star Trek, as she was known, married Roddenberry in Japan in August 1969, after the end of the original Star Trek TV series. She also worked in other TV shows, like Bonanza, The Untouchables, and The Lucy Show, with Lucille Ball. 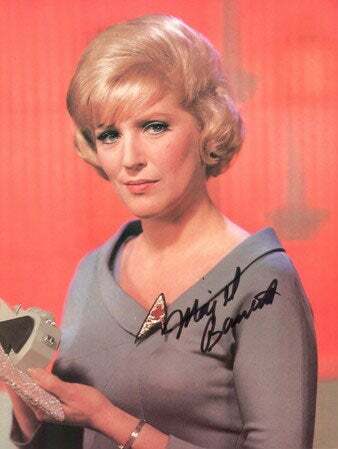 She also was the voice of the USS Enterprise in every single movie and TV episode of Star Trek. She then returned in The Next Generation, trying to take the underpants off Jean Luc Picard as Ambassador Lwaxana Troi, and returned to the screen in Deep Space Nine, where she was actually able to take off the underpants of Constable Odo.